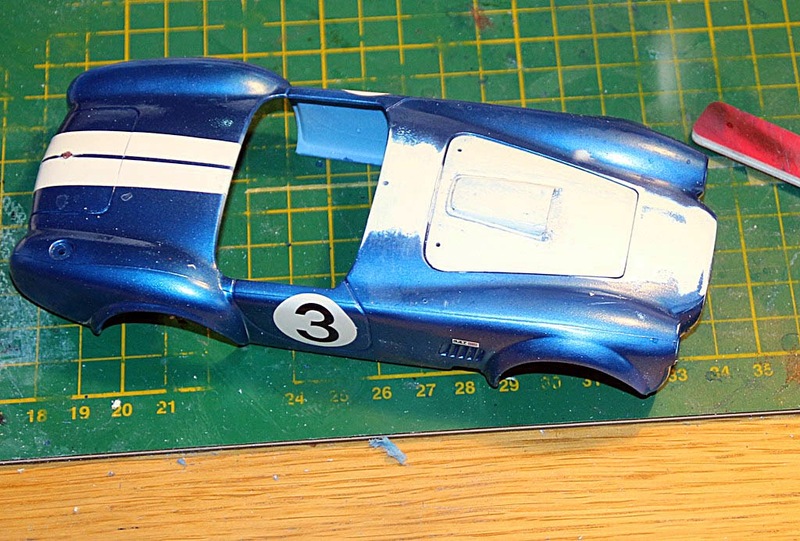 Gentle Scale Modelling: Fujimi Cobra - and so it goes! Fujimi Cobra - and so it goes! The day dawned bright , clear and cold. I had thought, overnight, what I was going to do to the Cobra body as I wasn't very happy with the depth of paint that had built up on the bonnet of the car. I decided to clean it all off and to repaint it. This meant that I could mask it up correctly. Previously, becuase I was going to use the decals, I was able to paint the body in blue and rely on the decals for the white stripes. 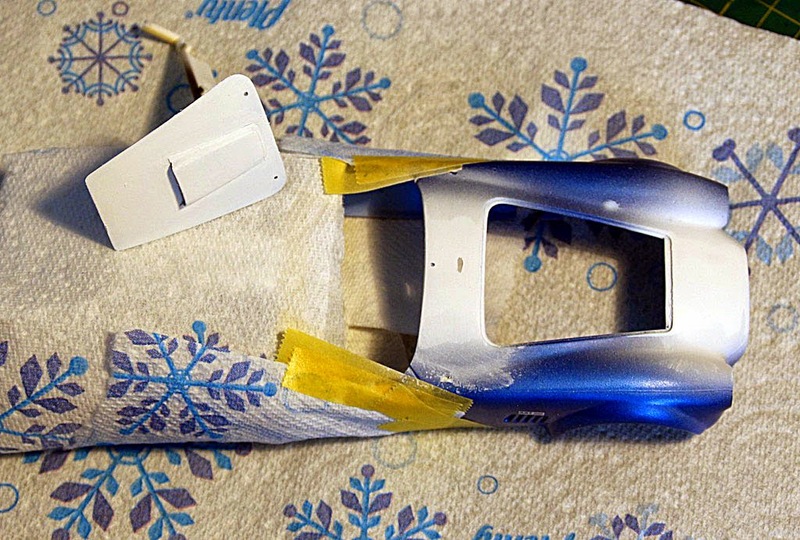 Without the decals, it would be best to paint the body white at first and then mask out the stripes whilst I painted the blue but, because I had the blue laid down already, I had to mask off the blue which meant masking out a 1mm strip down the middle of the car. Not easy! This time, I could paint the car white first - not all the car of course, because all of the other decals were already on, so just the bonnet area. However, firstly, I had to get all of the old paint off first. After a while with degrees of sanding sticks and some IPA, I was able to get it clear and clean. I then gave all of the affected area a coat of white. 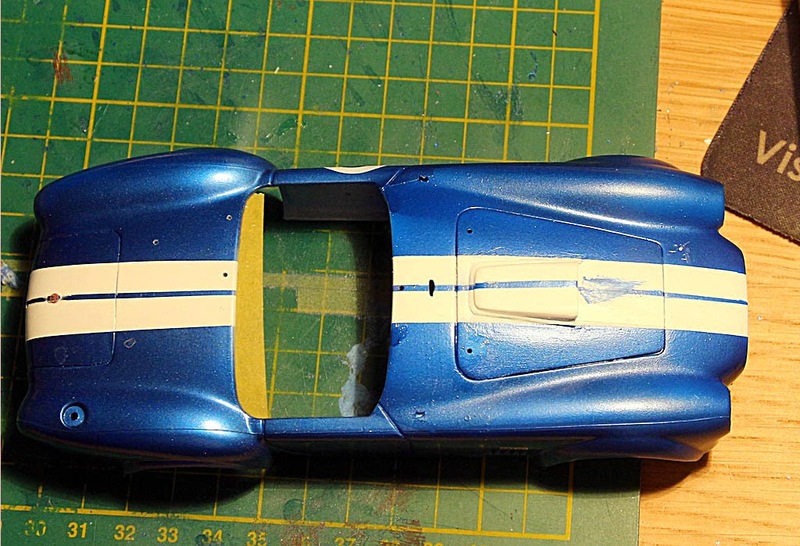 With it all looking hunky-dory, I then masked out the stripes and painted the final blue top coat. However, I had a disaster when taking the masking tape off. I had previously coated the car with Klear to protect the decals. Ha! Half of the number 3 on the right hand side of the car peeled off with the tape. Fortunately, I had three white circles from the Fujimi decals so this wasn't to big a disaster. I managed to remove the rest of the decal fairly easily and, as I had to make one 3 up anyway, making two wasn't going to be an issue. It was when I took off the masking tape that I decided that I could build something else for a while and let this one get out of my hair. Have a look. The blue hadn't taken properly in the middle of the two white stripes so I tried (!!!!) to hand paint it in. What a mess. My wife's comment was "Put it away for a while and make something else!" Looks like one of those kits where you can later say "I learned a lot while doing that one". Shelby Cobra 427 Finished - Finally!